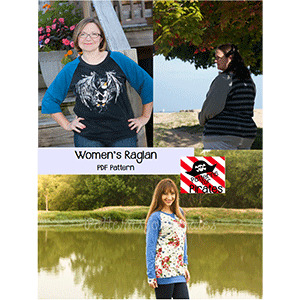 This beginner knit pattern has all the style you need in a soft comfortable shirt! 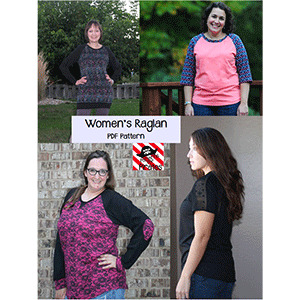 It is a loose fitting raglan sleeve tee and comes with LOTS of options! Sleeve options: short, 3/4, long with cuffs. 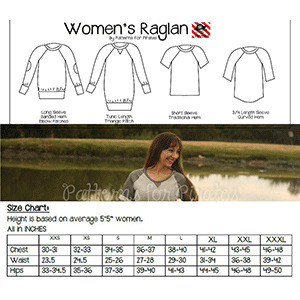 Hem line options: traditional straight, curve hem, tight and loose banded hem, and tunic length. Also, triangle and elbow patches are also included in the pattern for a fun add on! 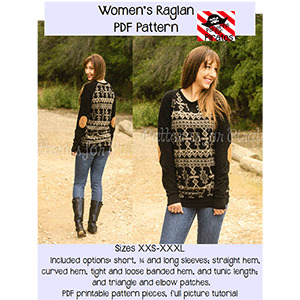 This pattern includes sizes XXS to XXXL. Suggested fabrics are knits such as cotton lycra, cotton jersey, french terry, cotton thermal, and ribbed knit.